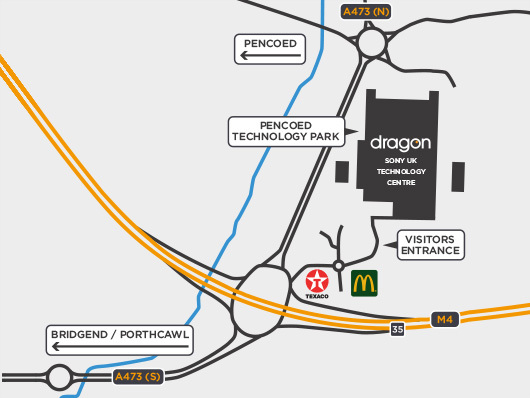 Dragon are based within the Sony Technology Centre at Pencoed, adjacent to junction 35 of the M4. As tenants of Sony, our premises are contained within a world class, secure, gated and guarded compound. High specification security features include 24/7 CCTV coverage and on-site security guards, perimeter security fencing, electronic security gates, electronic pass-protected access as well as fire suppression, sprinkler and alarm systems. From all directions, come off the M4 at Junction 35. At the large roundabout take the exit after the A473N looking out for Pencoed Technology Park (Visitors Entrance) which is one and the same as the Sony UK Technology Park. This exit is alongside a Texaco garage and a McDonalds. Follow the road, crossing a mini roundabout, to Sony’s security lodge who will let you through into the visitors car park. Please then make your way into Sony’s reception, above which are the Dragon offices.